Chieko Asakawa, a researcher at IBM, navigates CMU's campus using NavCog. Here is a uniquely 21st-century problem that blind people face: They hear someone say, “Hello” and retort with a “hello.” Then the first speaker trails off into what seems like a non sequitur, and the blind pedestrian awkwardly realizes he or she was answering a cell phone. But Asakawa, a veteran IBM researcher whose past projects have included a Braille word processor and a talking Web browser, has a solution—one that relies on the same technology that begat the dilemma. Asakawa, an IBM research fellow, is currently the IBM Distinguished Service Professor in CMU’s Robotics Institute. 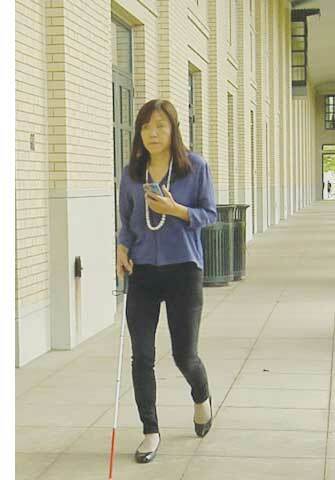 She and her collaborators, Kris Kitani of the Robotics Institute and Jeffrey Bigham of the Human-Computer Interaction Institute, imagine a time when a blind person will plug into a smart phone app that connects to a sensor signal, which will guide them step by step, literally, through a public space. The same Siri-like voice that will someday be able to tell them to “walk three steps and open the door on the left” also might then identify passersby via facial recognition software. It will even say if the acquaintance seems happy or sad, and whether or not they’re holding a phone to their ear. Called NavCog, it’s one of several projects under development by CMU and IBM researchers that seeks to use personal technology to help people with sight impairments. From apps to helper robots, it’s the kind of technology has the potential to remold almost every aspect of the lives of the blind. The NavCog project on which she is working has spread 250 Bluetooth signal emitters called beacons—white squares a bit smaller than the average smoke detector—through three School of Computer Science buildings: Newell-Simon Hall, the Gates Center for Computer Science and Wean Hall. The signal currently offers directions around campus. You can plug in, choose start and end points, and a voice guides you. “It’s like a navigation system that makes both outdoor and indoor navigation seamless, for humans,” Asakawa says. Her team hopes that someday, major foot-traffic areas—like airports, bus stations, malls and concert venues—are dotted with beacons to make areas more accessible for people with limited or no vision. They hope to add other facets, such as facial recognition, to an overall smart phone package for the sight impaired, allowing an easier pedestrian experience. Kris Kitani, a collaborator on NavCog, has developed another smart phone app called EdgeSonic, which he describes “audio Braille for images.” EdgeSonic can take an image captured by a smart phone and turn it into a crude representation of the most pronounced lines in the photo. The user can then trace her finger along the phone’s image and it will create differing clicks and bleeps as she moves along the edges of the objects and outside of it. It will be an audio language that reads shapes, essentially. The blind person could photograph a table or shelf and get an audio map of the objects on it. EdgeSonic also has less utilitarian uses, Kitani says. The user could snap a photo of a Christmas card and feel along the outline of a tree, “hearing” the parameters of the object. TechBridgeWorld’s first project was developing computerized Braille tutors for the Mathru School for the Blind in India. The first version of the tutor connected with a computer, while the second was battery-powered and its own on-board computing. Easy to use and transportable, the tutors have now been provided to organizations serving the visually impaired in six other countries.